GridCast: live and behind the scenes of grid computing: Is it Cloudy? No! It's OpenNebula! Is it Cloudy? No! It's OpenNebula! Cloudy again? Well, let's do something related (and hope not to have the same storm like yesterday night)! 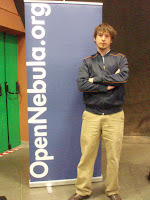 At 14.00 I recommend you to attend Tino's talk at Caravaggio Room on the OpenNebula Virtual Infrastructure Engine. Even if Demo Sessions ended yesterday, Tino will be at Demo Booth 4 and he will be very happy to show you it in action.